Background: Left ventricular hypertrophy and myocardial remodeling occur with aortic valve disease and may lead to heart failure. Although increased oxidative stress and inflammatory factors have been implicated in heart failure, their role in the progression of valve disease remains unclear. Objectives: We investigated the role of oxidative stress and inflammatory factors in valve disease whether this relates to cell death. Methods: Blood samples were taken from 24 patients with valve disease before surgery and the results were compared with those from blood samples from 30 control healthy subjects. Myocardial biopsies from patients with valve disease were also collected before cannulation of the right atrial appendage. NF-κB activities in atrial and mononuclear cells nuclear extracts were determined by electrophoretic mobility shift assay. Results: Nuclear factor kappaB activities were significantly greater in mononuclear cells from AVD patients compared with healthy controls and the antigens were detectable in atrial tissues valve disease patients. Plasma C-reactive protein, B-natriuretic peptides, plasma tumor necrosis factor alpha and soluble tumor necrosis factor receptor 1 and 3-nitrotyrosine levels were significantly higher in valve disease patients. Inducible nitric oxide and 3-nitrotyrosine antigens and cells expressing CD45 antigens were detected within atrial tissues obtained from valve disease patients suggesting oxidative stress originated from in situ leukocytes. 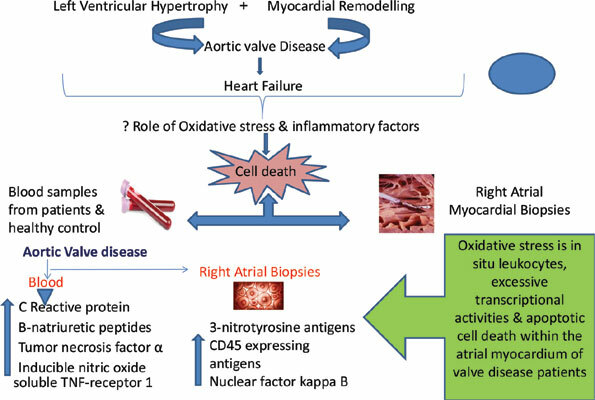 Conclusion: The findings suggest that oxidative stress originating from in situ leukocytes within the atrial myocardium may be the potential trigger for excessive transcriptional activities and apoptotic cell death within the atrial myocardium of valve disease patients. This represents a potential therapeutic target. 3-nitrotyrosine, C-reactive protein, B-type natriuretic peptide, 8-iso-prostaglandin F2α, human myocardium, mononuclear cells, NF-κB, aortic valve disease.